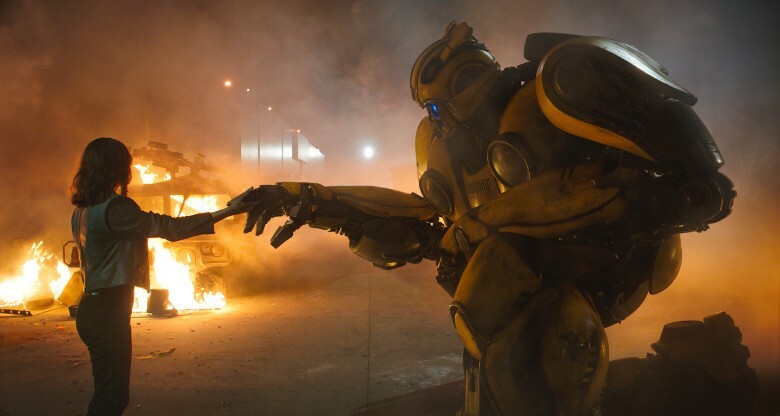 We have a nice interview for you from Travis Knight, the director of Bumblebee, where he explains why Bumblebee and Charlie had to part ways at the end. He reinforces the stand alone nature of his Bumblebee movie. The interview comes from Comicbook.com (who once again misses the mark with its headline, a trend with Transformers news). Simple answer. "We still wanted it to end like a prequel just in case." omega666 wrote: Simple answer. "We still wanted it to end like a prequel just in case." I mean, I am sure that was a factor, but I was saying the same thing the Director did when this came out. Them splitting up was just a natural fit to the morale of thr story. Charlie's whole arc was built on her not getting closure with her Dad's passing. Bee gave her a way to bridge that so she could move on. Meh, pretty blah explanation. I don't think they really had a plan so they made it a stand alone for merchandising. Man, who cares if the lead is a chick or dude? I just want to enjoy the flick. So long as it ain't bein' preachy an stuff. Bee is a good movie and I liked it a lot. Now you wanna talk about "strong female leads"... that evil femmebot in the movie.. man, she was vicious and cunning. I de only one that sees dat? At the dude rantin' about Rainbow Brite... hey, ever heard of a Brony? Yeah ya have, it's the internet. If ya think chicks never played with 'Formers either... bhaha, man you don't know much. I know a chick growin' up that loved playin' Wolfenstein and Doom on the computer, and she weren't no tomboy either. She had a YUGE Barbie collection, girly sheets, and totally fell for a big masculine guy. Peeps gonna like what they like. Dey just more open 'bout it now 'cause guys don't gotta worry 'bout bein' called a sissy so much no more. I like ponies and I like 'Formers. I drive a fast car and eat spicy foods. I cuddle kitties. I shoot gunz. Am I a sissy for any of dat? Am I a macho man? I really don't care! Just chillax and enjoy the flicks, man. EunuchRon wrote: Man, who cares if the lead is a chick or dude? I just want to enjoy the flick. So long as it ain't bein' preachy an stuff. Bee is a good movie and I liked it a lot. Now you wanna talk about "strong female leads"... that evil femmebot in the movie.. man, she was vicious and cunning. I de only one that sees dat? EunuchRon wrote: Bee is a good movie and I liked it a lot. Now you wanna talk about "strong female leads"... that evil femmebot in the movie.. man, she was vicious and cunning. I de only one that sees dat? Shatter is my favorite Decepticon, and was worth going through the movie frame by frame to get some awesome screen captures for backgrounds. Now that the Bumblebee movie has hit home Director Travis Knight continues making the interview rounds. This time he spoke with MovieFone about some very specific topics. We had this scene early on in the script. It was a “Sorcerer's Apprentice”-type moment where Bumblebee transfers his energon on to some of these appliances is in the house. We boarded it out and it was a lot of fun and but we never got it to work as a finished thing. It's one of those things where you share a work-in-progress with the world and you don't really want them to see it because I'm not done. But we did a fair amount of work on that sequence and in the end for a variety of reasons, for both tone and for pacing. While on its own, it was going to be a ton of fun, it just didn't propel the movie forward. It stopped the movie in his tracks for essentially this fun little moment and really wasn’t about our characters or their or their experiences, their growth or their relationship really. Continuity is very important to me, as is being consistent. And so I did take a good hard look at the films that had been done in the past. And as we were thinking about this movie, I still wanted to move to be self-contained. I didn't presuppose any familiarity with the films or the franchise. I wanted someone who wouldn’t know anything about the Transformers to be able to sit in the theater to watch this movie and have a good time and enjoy the movie, not knowing anything about the transformers. But that said, it was important to me that if we were living within this universe and this mythology that it be consistent. At some point we realized that we were essentially boxing ourselves into a corner -- that we were, we were making choices that weren't really in the best interest of the film if we were trying to kind of sit within the overall mythology of the franchise. Once I talked through some of these things with the producers and with the folks at Paramount, at some point we made the decision that this was the story that we're telling and we have to talk the best where we can. And if that means that we essentially are restarting the franchise and that means we’re rebooting these characters and they were taking aspects of the franchise and putting a different prism on it, then that's what we had to do. And ultimately it was a liberating choice because then we weren’t cornered into these decisions based on what had come before. We could tell our own story. And that that was the aspect of that. [laughs] Well, we wanted to showcase how much of a threat that our baddies and that if Charlie or Bumblebee some face-to -ace with these antagonists, they are in very big trouble. We wanted to show right away that these characters are a real threat. However in keeping with like you said, some kind of Joe Dante, family, Amblin-y vibe, you try not to be grotesque. We still wanted this to be a family movie. And so even though what the Decepticons do to people is horrific, there's still a comedic element to it. It’s still kind of fun, even though it's gross and awful. You can watch it and give you a little bit of a smile on the corner of your mouth. But that was the idea -- it wasn't horrific and grotesque, that that it was communicated what we want to but, in a family-friendly way. I will say that when we shot that stuff practically, people would get it all over their shoes. It was disgusting. The full interview can be read at the link above and you can discuss it in the Energon Pub forums below! “We wanted to keep the film in the same universe as the previous films, but I wanted to everything to be like my childhood only and have everything G1, because I hate change and everything has to be exactly as it was in the 80’s. -I’m just a casual, mostly chill Aussie doing Tradework and lovin robots. -I actually don’t hate G1 (despite how this post comes across ). - Prime and Animated are Good stuff. - I appreciate when continuity’s try to be interesting. - hope I can fit in nice and easy. - I can’t edit my profile and I don’t know how to. I’m still confused. Does this mean Travis confirmed Bee being a reboot? Yeah, he doesn't outright say if they ended up rebooting or not, kinda instead beating around the bush on either side of the matter. It seems like DiBonaventura has put out a statement almost every week for the past 4 or 5 weeks, each one making less sense than the previous. At this point, BB is just a solid film, and I personally don't care if it's a reboot or not. DiBonaventura's statements are to the point of not even being news really. Wait until Paramount actually has another movie in development, (not just random ideas) then tell us something. o.supreme wrote: It seems like DiBonaventura has put out a statement almost every week for the past 4 or 5 weeks, each one making less sense than the previous. At this point, BB is just a solid film, and I personally don't care if it's a reboot or not. DiBonaventura's statements are to the point of not even being news really. Wait until Paramount actually has another movie in development, (not just random ideas) then tell us something. This is from Knight, though. robotcaveman wrote: I’m still confused. Does this mean Travis confirmed Bee being a reboot? He said the same he always said, a pequel to what we know with a bunch of elements that dont line up. A stand alone film for fans of movie bumblebee. Turnin' people to goo vs wut Lockdown did to Weasel? Good call, and ya, I luv how dey pop too! I still like the 'Cons weaps in DOTM durin' the invasion from da moon best tho. Turned peeps to bones. BONES. Dat was some solid awesome. Heh, I like it when they pop. yeah, but its not something we didnt already know. The big thing people want to know is if we are done with bayverse. Bumblebee which stradles very closely to the prequel territory did not offer a definitive answer (purposefully) and I don't think we will get one. But I dont think it matters really. Bumblebee has a ton of Bayverse influence and was still great. As I wrote before, I dont think fans dislike Bayverse really, they just dislike bay. And Bumblebee was our first look at that distinction. I mean, he had the same Bayverse face and the same radio voice gimmick, criticisms that have been going 10 years now, and yet people still liked it. AOE had just as much reboot elements as Bumblebee (new cast, new characters, new looks) but since Bay was still at the helm, no one ever mentioned the word reboot. william-james88 wrote: I dont think fans dislike Bayverse really, they just dislike bay. I'm over the Bayverse stuff, but I have nothing against Bay. Whether people like it or not, the guy is a talented Director, and while as Director, he has to shoulder a lot of the criticism, to me, the movie got progressively worse and worse. 5,466 pages were recently viewed by 934 unique visitors. This page was viewed 2 times on Saturday, April 20th 2019 9:38am CDT. © 2019 Seibertron, Inc. DBA Seibertron.com. All Rights Reserved. Established June 2000. Seibertron.com is owned by Ryan Yzquierdo.